Curbing traffic jam, pollution, limited car park space via car pooling. We are developing a matchmaking website between a driver and a rider to seek companionship to the same destination via our website. This project intends to curb traffic jam, pollution, limited car park space and the green house effect. We pledge support for this project as it will benefit the community and thus promote the 1Malaysia concept via ride sharing. 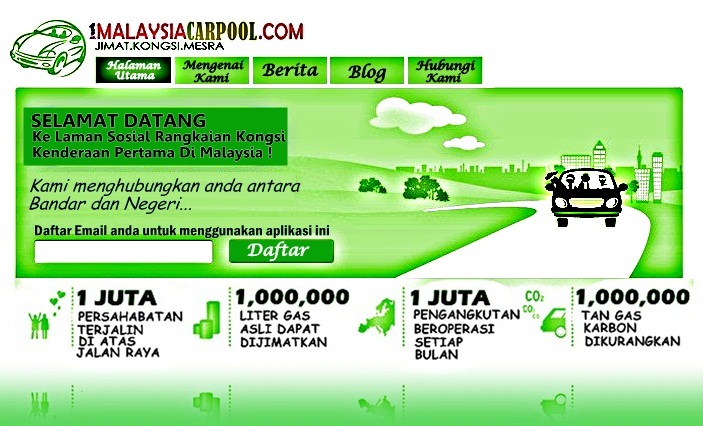 We need about RM10,000 to fully develop the website and all the money will be spend to fully develop and launching it. However, the person must send pitchIN the proof of transfer by attaching the receipt to the email address: [email protected] with the Subject Heading: 1MCP. Upon receiving that, the folks at pitchIN can then quickly update the project page.